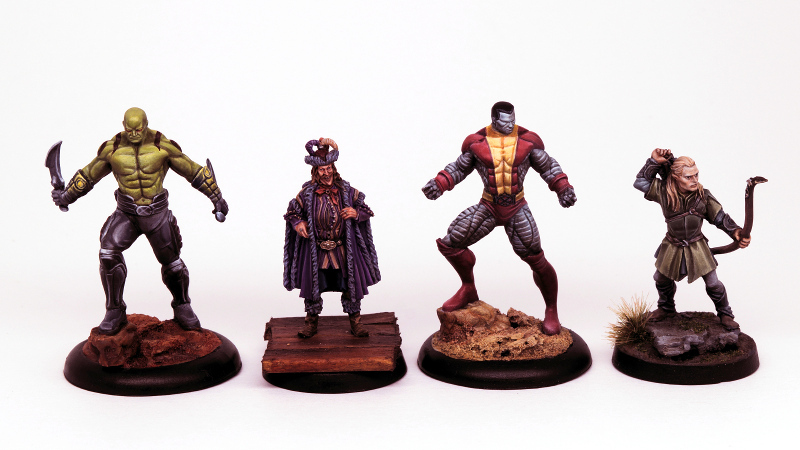 This tutorial is for painting Wolverine by Knight Models. To paint the yellow parts of the clothing a basecoat of deamonic yellow was applied. Followed by a wash of desert yellow. A wash of fur brown. Oak brown was applied to the recesses. Deamonic yellow was reapplied to the surfaces of the muscles. A mix of deamonic yellow and skeleton bone was applied to the upper surfaces of the muscles and creases. The blue parts were basecoated with crystal blue. Then washed with deep blue. Crystal blue was reapplied leaving the deep blue in the recesses. The first highlight was a mix of crystal blue and electric blue. Followed by a highlight of electric blue. A final highlight was electric blue and white. The skin was basecoated with babarian flesh. A wash of flesh tone was then applied. The basecoat colour was then reapplied leaving the was in the recesses of the muscles. The first highlight was a mix of barbarian flesh and skeleton bone. Followed by adding white to the mix. The claws were basecoated with gun metal and highlighted with silver. The belt was basecoated with oak brown, highlighted with fur brown and skeleton brown. With all the parts painted a lining was applied with a dark mix of black and oak brown. A final highlight of white was applied to all areas.